I keep noticing shirts, books, music, television shows, highlight the “glamor” of a rock star lifestyle to my children. 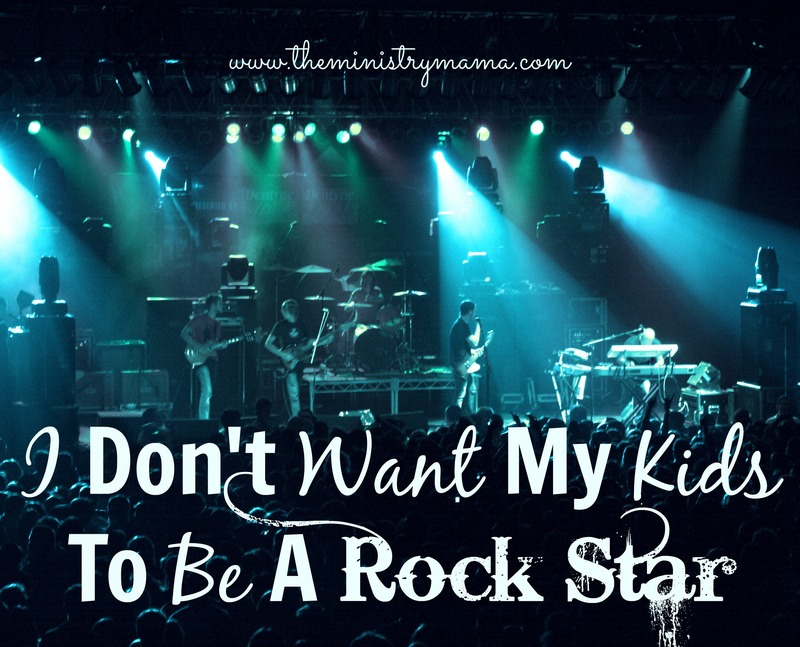 As a Christian mother, I have to say, I don’t want my kids to be a rock star. Seriously, I thought this rock star phase would be over by now, but scrolling in search of books I spied a toddler level book about teaching your children to be Bible rock stars. Toddlers being rock stars? and Bible rock stars at that!? Why does this just seem so wrong? Because it is…I understand the phrase is popular, but the idea, to me is just not Bible-centered. The Bible does not have anything to do with being a rock star. There will be no Bible rock stars at my house. You do not have to accept the world’s philosophy as it seems crammed down your throat in every store in the clothing and toy section. It isn’t enough that they target young and older adults to find acceptance through singing songs that appeal to the “old” man (Romans 6:6). But little kids!? It is just another way for Satan to begin grooming children for his desires for their future. Frankly it all boils down to parents in my generation and what they like. Whatever they like they give to their kids. It doesn’t matter whether it is Biblical, it matters whether it’s cool, popular, and most importantly nostalgic. Children many times do not know any better. They are young and innocent and will accept things without knowing the meaning behind them. Many parents will guffaw at the thought of me writing about this, but honestly, if our children were to leave home and pursue a lifestyle that embraced the world and threw their “Christian upbringing” behind, then they would hit their knees in prayer pleading for their return. Or maybe like many people I’ve seen, they would applaud their efforts for using the talent God had given them in almost every other venue and not for the Lord in their own church. Minimizing the subtle tactics of Satan, may be maximizing your child’s potential for not loving God with all of their heart, soul, mind, and strength. Yes, I realize, we can make mountains out of mole hills and mole hills out of mountains, but what will it take for many of us to stand up and protect our children from society’s pressure of making them the product opposite of God’s plans for their lives? A toddler will not necessarily understand the board book they are reading says “Baby Rock Star,” but it’s the next step of buying the rock star shirt, doll or Lego set, or the fast paced guitar strumming video game. Are kids viewing these things as acceptable because we allow it little by little? It takes simple choices of seeing the rock star mentality creeping in and eliminating the influences. It may be that you have to redirect your child at the shopping rack, toy department, or video game area or replace things you already have at home that are promoting things contrary to God’s Word. The Holy Spirit will lead and guide you if you will allow Him to. Most of us do not have to make huge changes in our lives to ensure the safety of our children when it comes to outside influences… but when it comes to the inside influence of ourselves we make exceptions. We need to be reading the Bible and applying its principles of protecting and guiding our children AND ourselves. We are the guardians of our children, the fences of protection and shields of their hearts, minds, and bodies. But how can we protect them to the fullest sense if we are allowing those things into our own lives by the music we listen to, places we go, and things we watch, and items we buy? It really isn’t all about society’s rock star exaltation, there are all types of lures that Satan is using to entice our children. You may not battle Guitar Hero but you may battle the exaltation of sports, fashion, extremely popular children’s movies or books, you fill in the blank. The enticements are not just coming from outside sources though. C’mon, too often they are originating from us, as parents, and our indulgences instead of our holiness. Proverbs 4:23 says, “Keep thy heart with all diligence; for out of it are the issues of life.” I don’t want my kids to be a rock star because I don’t want them to be adult rock stars. Their hearts require my diligence, because out of those little hearts come the issues of life. God forbid that my negligence in allowing something that was even borderline between righteousness and unrighteousness would be where the lure of their downfall began. Consider the Biblical example of Abraham and Lot. Where did Lot get a taste for Sodom? In Egypt where Abraham took him in one of his flights in fear. Many people would roll their eyes and say, “It’s all about balance, letting kids be kids and do the things that kids do.” We need to be making the deposit of Biblical influences greater in our children’s lives greater than the weight of the world’s influences. You’re right, it’s about the type of balance. Our child’s balance should contain so much of God that the world’s influences will never outweigh the amount of love they have for the Lord. I want my kids to know that the Christian life is more exciting than a rock star’s life! A rock star’s music speaks to the flesh, God’s music speaks to the heart. A rock star lives a life in front of people lonely for true friendships. A child of God serves people and always has God to walk beside them and good Christian friendships too. A rock star seeks to please others through their fashion and music. A child of God seeks to please God through their obedience. A rock star uses money for indulgences. A child of God earns money to take care of their responsibilities and minister to others. A rock star lives in pursuit of personal gain. A child of God lives in pursuit of God. Period. A rock star uses his talents to woo people to buy albums so they can get money in their bank to fulfill their heart’s desires. A child of God uses his talents to woo people to Jesus Christ and minister to the hearts of those who are already saved. God then fulfills their heart’s desires. We are not superior to any type of people who choose to live a rock star lifestyle. But for the grace of God, I could be in that situation doing that very thing. Righteousness is not even obtained through what we do or do not do. It is given to us at salvation in exchange for our sinfulness. Our children do not know the perils that lie ahead of them in this life or the tactics Satan will try to maneuver against them. Please guard your own heart so that you can be wise enough to guard the hearts of your child(ren).